If you tap a finger on top of the new Invoke smart speaker, it might meow. You may also get a fact about otters or elbow licking, and hear a dad joke. This oddball feature is one of the few unique things on the new Harmon Kardon Invoke. The $200 smart speaker, available October 22, is the first to use Microsoft’s Cortana voice assistant. Microsoft has taken a different approach from Amazon, Google and Apple for its first foray into voice-activated speakers. 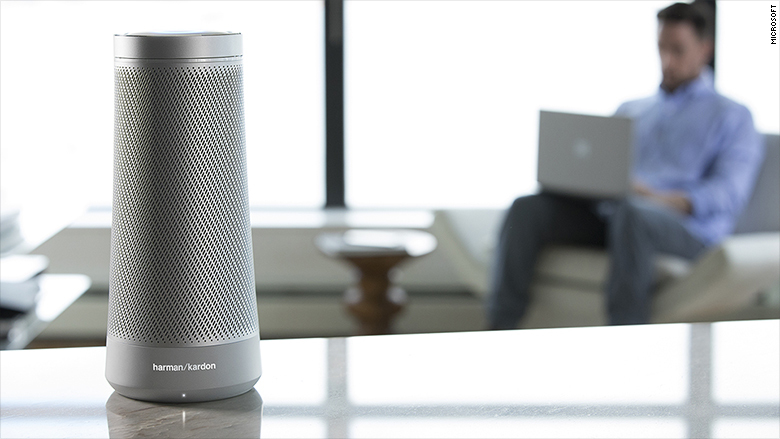 Instead of building its own device, Microsoft (MSFT, Tech30) let speaker company Harman Kardon design one specifically to work with Cortana. Other brands are also working on Cortana speakers. The result has sound superior to smart speakers made by Amazon (AMZN, Tech30) and Google (GOOG). The Cortana assistant has the most natural sounding voice of the bunch but sub-par assisting powers, at least for now. A tall tapered column of black metal, the Invoke looks similar to the original Amazon Echo, including the undulating blue LED light on top. Inside there are three tweeters and three mid-ranger drivers pointed in different directions for 360-degree sound. It has seven microphones, also arranged to pick up the wake phrase from any direction. (Speaking of the wake phrase, making it “Hey Cortana” and not just “Cortana” is a puzzling decision). Released three years ago, Cortana has been available on Windows 10 devices and in smartphone apps. The company has put a lot of work and resources into the assistant. Cortana’s responses are very smooth and natural sounding, often more human-like than Alexa or Google Assistant. It will sometimes use the opportunity to make a groan-worthy joke when it doesn’t know an answer to a question you ask it. It’s a big fan of animal sounds and enthusiastic expressions like “Woo-hoo!” It also told my child a very terrible bedtime story (“You’re getting sleepy, very sleepy… good night.”). It could use about 25% less cute. 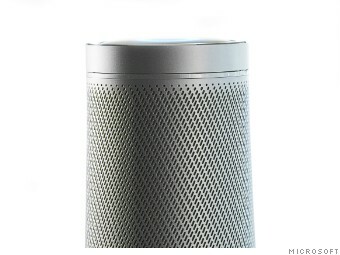 Microsoft’s angle is that the Invoke is a smart speaker for professionals. It does a solid job adding events to your Outlook calendar and integrating with Microsoft services. You can’t ask Cortana to send emails, but it does integrate with Skype for phone calls and lets you set reminders. There are some rough spots. Sometimes its reaction time can be extremely slow. Tapping the top of the device doesn’t always work. Since Microsoft has no music service of its own, the Invoke defaults to Spotify, TuneIn or iHeart Radio. Pandora isn’t currently supported. While the sound quality is tops compared to the current Alexa and Google Assistant-powered devices, it might have more competition from the new Sonos with Alexa, the Google Home Max and Apple HomePod — the latter two coming later this year. This speaker will work best for anyone tied-up in the Microsoft ecosystem. People who use Outlook, Skype and the Microsoft owned Wunderlist. Currently, it only has about 100 third-party skills (that seems to be the agreed upon term for voice assistant apps), but more are expected soon. As the competition heats up, things are getting prickly between the companies, potentially forcing customers to choose a side. You could end up choosing a smart speaker based on what works most with the services and smart gadgets you already have. Microsoft is a late arrival, but it has a natural audience of people already using Windows devices and Cortana. For everyone else, it’s probably worth waiting to see what skills come out, and how the HomePod and new Google and Amazon speakers perform before committing to living in a Cortana home. Unless you’re really into cute animal sounds. Cortana is the best in the field at those.